Sci Transl Med 2014 6(250), 250ra112. Ixazomib (MLN2238) purchased from Selleck. (F) EMSA demonstrating NF-κB activity in nuclear extracts from patient cells from a T-LGL or NK-LGL patient treated with rhTRAIL (10 ng/mL) or rhTRAIL (10 ng/mL) plus increasing doses of ixazomib (0-100 nM). Blood, 2018, 131(25):2803-2815. Ixazomib (MLN2238) purchased from Selleck. 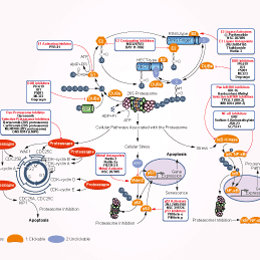 Other proteasome inhibitors that trigger Mcl-1128-350 generation and c-Jun upregulation. MM.1S cells were treated with carfilzomib (Carf), ixazomib (Ixaz), MG-132 (MG), or left untreated. After 24 h, total cell lysate was immunoblotted with Mcl-1, c-Jun and Tubulin. Cancer Lett 2014 343(2), 286-94. Ixazomib (MLN2238) purchased from Selleck. Starved WT keratinocytes were treated without (lane 1) or with high calcium (lanes 2-5) in presence of indicated amount of proteasome inhibitor MLN2238 (lane 2-4) for 12 hrs as indicated. Cells were then subjected to immunoblotting analyses using anti-Ctip2 antibody. β-Actin, loading control. All experiments were performed in triplicates. J Cell Sci 2012 125(Pt 23), 5733-44. Ixazomib (MLN2238) purchased from Selleck. 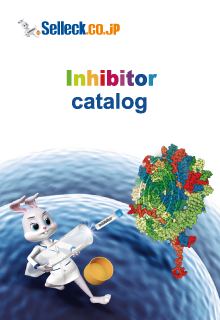 Ixazomib is a slow-binding competitive inhibitor of the 20S proteasome. (A) Plot of the initial phase velocity v0 for the 20S proteasome-catalyzed hydrolysis of Suc-LLVYAMC determined over 2 min directly after the addition of varying concentrations of ixazomib to the assay mixture. The initial velocity was essentially unchanged at ixazomib concentrations up to 15 nM, which indicates that ixazomib did not competitively inhibit the 20S proteasome in a rapid pre-equilibrium binding reaction, at least over this concentration range. The straight line was linear-least squares calculated and has a SE about equal to the value of the slope. (B) Plot of the final phase velocity vS for the 20S proteasome-catalyzed hydrolysis of Suc-LLVY-AMC calculated from curve fitting of progress curves to an equation for slow-binding kinetics. The curved line was nonlinear-least squares calculated from fitting a two-parameter saturation equation (Eq. (4)) for KI yielded a KI of 4.9 ± 0.4 nM, consistent with ixazomib being a slow-binding competitive inhibitor of the 20S proteasome. Arch Biochem Biophys, 2018, 639:52-58. Ixazomib (MLN2238) purchased from Selleck. Nrf2 bound to ARE sequences was measured by immunoassay in nuclear extracts from K562 cells after treatment with tBHQ, bortezomib and MLN 2238. Hemoglobin 2014 38(3), 188-95. Ixazomib (MLN2238) purchased from Selleck. A first-in-class proteasome inhibitor that has improved pharmacokinetics (PK), pharmacodynamics(PD), and antitumor activity in preclinical studies. Calu-6 cells are cultured in MEM containing 10% fetal bovine serum and 1% penicillin/streptomycin and plated 1 day before the start of the experiment at 1 × 104 cells per well in a 384-well plate. Proteasome activity is assessed by monitoring hydrolysis of the chymotrypsin-like substrate Suc-LLVY-aminoluciferin in the presence of luciferase using the Proteasome-Glo assay reagents according to the manufacturer's instructions. Luminescence is measured using a LEADseeker instrument. 実験の流れ： Calu-6 cells are cultured in MEM containing 10% FBS and 1% penicillin/streptomycin and plated 1 day before the start of the experiment at 1 × 104 cells per well in a 384-well plate. For IC50 determinations, cells are treated with varying concentrations of Bortezomib or MLN2238 in DMSO (0.5% final, v/v) for 1 hour at 37 °C. For reversibility experiments, cells are treated with either 1 μM Bortezomib or MLN2238 for 30 minutes at 37 °C and then washed thrice in medium to remove the Bortezomib or MLN2238. Cells are incubated for an additional 4 hours at 37 °C, after which the medium is removed and replaced with fresh medium. Lee EC, et al. Clin Cancer Res, 2011, 17(23), 7313-23.